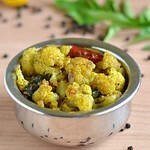 Cauliflower is one of the most loved vegetable at home. Kids love it no matter whatever dish I make out of it. 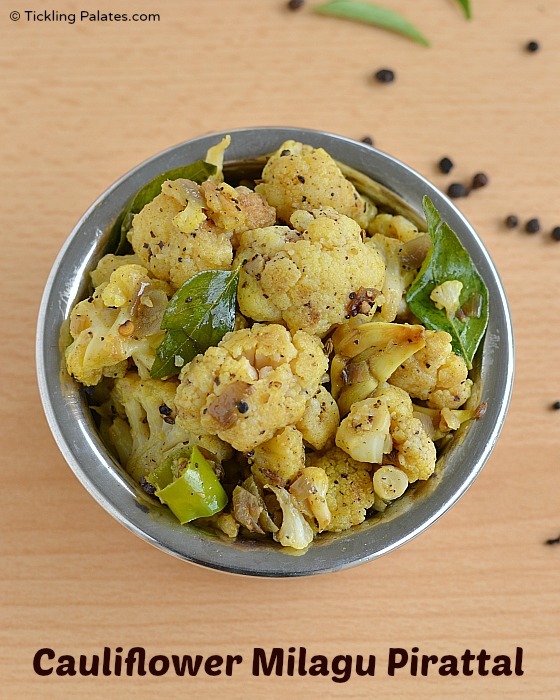 Cauliflower is one veggie that can be cooked many ways and it handles both North Indian and South Indian cuisines like a charm. This pepper fry is one such dish that is very simple to make as it does not require a whole lot of spices as such the case in any chettinad recipe. Its also a spicy stir fry as that is how we love it at home. 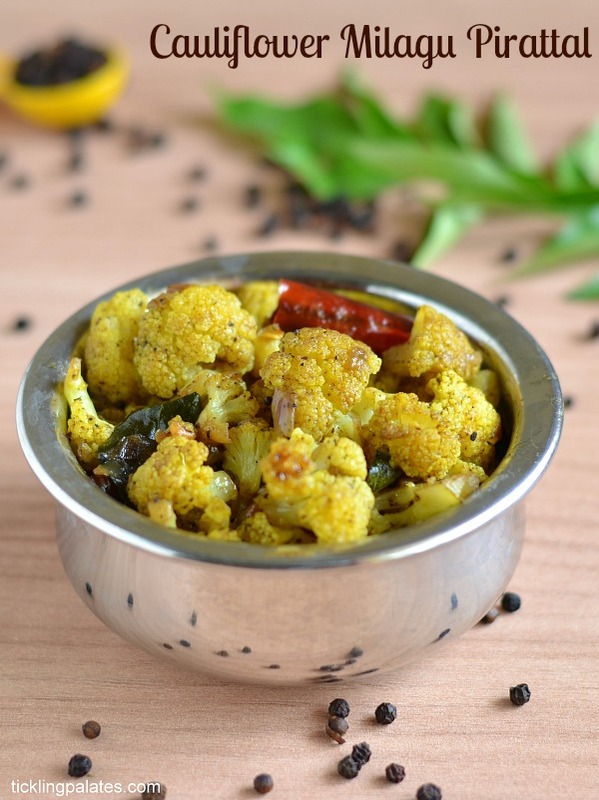 As it is since, cauliflower is a bit sweet in taste, you need increase the spice level which can be always be adjusted according to one’s taste. 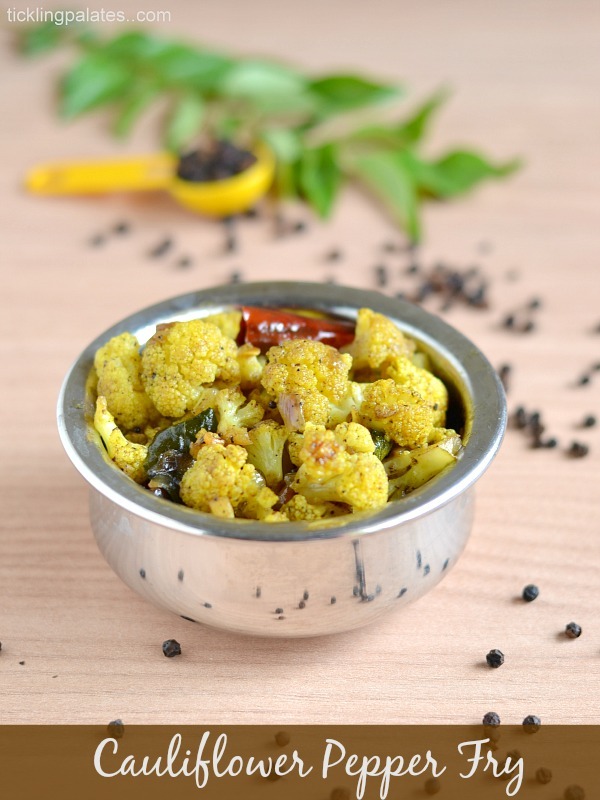 This chettinad style cauliflower milagu pirattal is also somewhat similar along the lines of Kathirikkai Chops recipe. 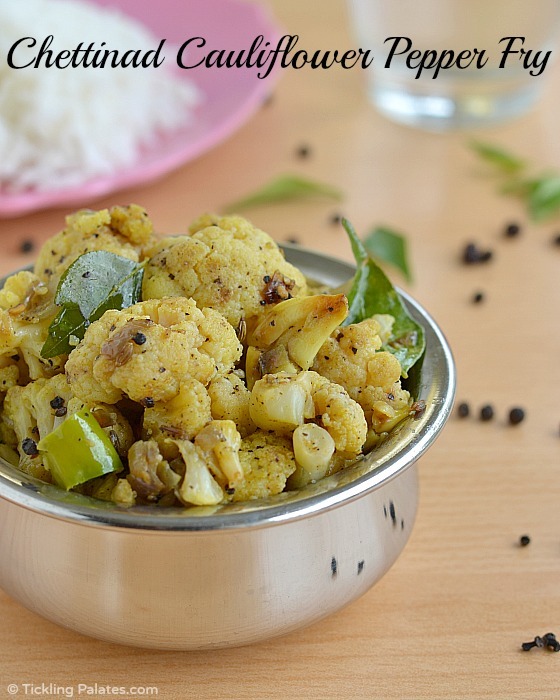 On the whole it makes a spicy, lip smacking side dish to both sambar and rasam rice. As the cauliflower season is in peak now, I’m trying one dish after other with cauliflower. As it’s a dry dish, it is perfect to pack for lunch boxes with out the fear of any spilling inside the bag as well. Chop the onions and green chilies finely and keep aside. Cut the cauliflower into bite sized florets. Bring 5 cups of water in a saucepan to a bubbling boil and immerse the florets for 2 mins. Drain the water completely and keep the florets aside. Powder the black pepper corn to a coarse powder in a mixie jar. Crush the garlic pods and keep aside. Heat a pan with oil. Add mustard seeds and when it pops, add fennel seeds and when they sizzle, add urad dal, broken whole dry red chilies and sauté till the dal becomes golden in color. Add crushed garlic and cook till it changes color. Now add chopped onion, green chilies, turmeric powder, curry leaves and cook till the onions turns translucent. Now add cauliflower florets, salt, black pepper powder and toss well. Cover the pan with a lid, leaving a small gap and let it cook over low flame for 3 to 5 mins. Remove from flame, toss once again and serve hot with rice. Do not over cook the cauliflower, they should maintain their shape and be a little crunchy, then only it will taste good. Make sure that the pieces are pieces bite sized and small as larger chunks will take longer time to cook and will become soft and soggy while cooking. Do not add any water while cooking and let the cauliflower cook in its own steam. Adding water will make the florets soft and soggy.